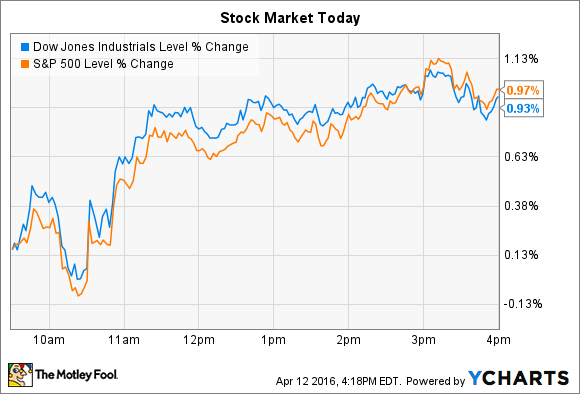 Why these two stocks broke away from broader indexes on Tuesday. Stocks logged solid gains on Tuesday after an early dip into negative territory gave way to strong buying through the rest of the trading session. By the closing bell, the Dow Jones Industrial Average (DJINDICES:^DJI) had added 165 points, or 0.9%, while the S&P 500 (SNPINDEX:^GSPC) gained 20 points, or 1%. The major economic news of the day was a 4% spike in crude oil prices to over $42 per barrel, which set a new high for the year and ensured that the energy sector led indexes higher. Chevron (NYSE:CVX) was a big beneficiary of that oil price swing, and Juniper Networks (NYSE:JNPR) also made a notable move on Tuesday -- but in the other direction. Chevron was the leading percentage-point gainer on the Dow, rising 2% to bring its year-to-date return to a solid 8%. Because it has greater exposure to commodity prices than peers, the oil giant's shares tend to move more closely with the changing outlook for the price of oil. Thus, Tuesday's sharp jump in crude oil prices had an outsized effect on the stock, just as it has since oil began climbing back from its low set in mid-February. A sustained move above $45 per barrel would boost operating results, but Chevron isn't banking just on a commodity price rebound to protect its long-term profits. The company is scaling back its capital expenditures and slicing expenses in a bid to increase cash flow. Chevron's dividend is currently accounting for well more than 100% of earnings, which isn't sustainable. Yet the gas giant has a plan to emerge from the oil price glut with a leaner, more profitable, and more flexible operation. In the meantime, Chevron will post first-quarter results on April 29, and consensus estimates project a brutal 40% revenue decline as earnings slump to $0.19 per share from $0.83 per share in the year-ago period. Networking technology specialist Juniper Networks' stock dropped 7% after the company warned that its Q1 sales and earnings would come in lower than anticipated. Executives dialed their revenue target down to $1.1 billion from the $1.2 billion they had projected back in January. Profits will also be surprisingly weak at $0.36 per share compared to the $0.44 per share they initially modeled. Still, investors shouldn't read too much into the drop as Juniper warned at the time about the "uncertainty of the global macro environment and potential lumpiness in customer investment patterns." Both trends appear to have negatively affected the Q1 results relative to management's expectations three months ago. There were two key reasons cited for the downgrade: weaker demand in the enterprise segment and a handful of large deployments that didn't quite make it into the fiscal Q1 calendar. These issues aren't likely to threaten Juniper's growth prospects for the full year, according to management. "We remain constructive on fiscal 2016 and expect growth from new products to contribute to our topline," CEO Rami Rahim said in a press release. Cost discipline should produce profitability improvements in the meantime, as Juniper aims to continue the healthy growth it has seen in its gross margin -- it was up to 24% of sales last year from 21% in 2014.